My HP Photosmart 2570 printer is extremely slow. what can I do to do to speed it up please. Unfortunately I'm not sure if this is possible, I would speak to HP directly. Why am I unable to fit a 336 cartridge into my HP Photosmart 2570 inkjet printer? The HP 336 black ink cartridge is designed to be used within the HP Photosmart 2570 (UK model). Please ensure that you are installing this into the correct cartridge slot. If you experience further difficulties then please contact our customer care team for further assistance. Has your Photosmart 2570 ink run dry? If so you might want to consider a cheaper way to buy your HP Photosmart 2570 printer cartridges. Our extensive range includes compatible Photosmart 2570 cartridges that are offered at a significant price discount for users on a tight budget. You can also try our compatible HP ink cartridges completely risk free because we cover every single cartridge with our cast iron money back guarantee. If you thought it couldn't get any better, wait... there's more. Our free next day delivery service means that you can order our discount HP 2570 ink cartridges online at no extra cost. Unlike other online sellers who usually apply hidden charges to your order we like to put money back in your pocket. Our award winning customer care team are available during Monday - Friday to ensure that any order of our Photosmart 2570 inks runs smoothly and fully meets your customer satisfaction. Don't miss out and make sure you snap up the best deal on your HP inks from Cartridge Save. There are many quality home printers out there on the market these days, and picking the right one for you can be a challenge with so many models to choose from. The HP Photosmart 2570 is certainly worth investigating further, however, as it has plenty to offer. Another fine example of the high quality Photosmart range from Hewlett-Packard, the HP Photosmart 2570 is proving very popular at the minute, and here are just a few reasons why. In terms of overall look and design, the HP Photosmart 2570 doesn't really differ greatly from many other items in the Photosmart range. A simple, subtle look is finished off with a grey colour scheme, but it is the user interface which really pushes the HP Photosmart 2570 into the lime light. Simple and easy to operate, the HP Photosmart 2570 has clearly been designed with a user in mind. Print outs made with the HP Photosmart 2570 are very impressive. If you are likely to use this item for a mixture of both text and image based documents, you will no doubt be impressed with the sheer quality of the results which the HP Photosmart 2570 can churn out rather swiftly. 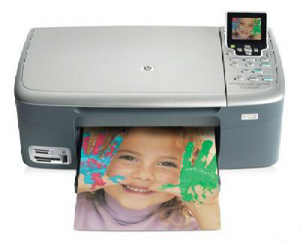 What's more, the HP Photosmart 2570 is quite reasonably priced for a Photosmart model. If the truth be told, there isn't much to complain about where the HP Photosmart 2570 is concerned. The only real grumble is not actually a fault with the printer itself, but the art of printing as ink might end up costing you a fair bit of cash if you plan on using the HP Photosmart 2570 regularly, but other than that, this is a fine item.